The Rebel Sweetheart. 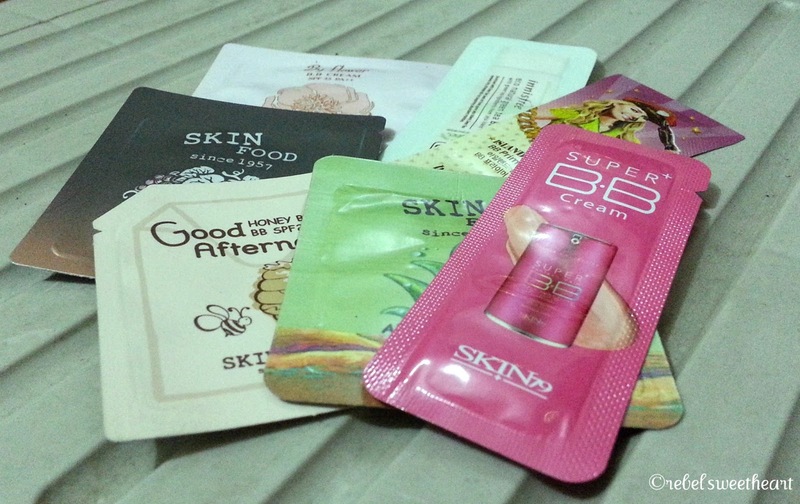 : Project BB Cream | SkinFood Good Afternoon Honey Black Tea BB. Project BB Cream | SkinFood Good Afternoon Honey Black Tea BB. I promise to do more BB cream features and reviews this year. More so now that I have blog followers who actually ask for my opinion when it comes to BB creams and Korean cosmetics. (Thank you, my dear readers! I am truly honored!) I even placed this stash of BB cream testers on top of my dresser as a constant reminder of my BB cream project. The goal: Review all these within the next six weeks (at least). Today I gave the SkinFood Honey Black Tea BB Cream a try. This is the second variant I'm trying from SkinFood's Good Afternoon product line, the first being the Rose Lemon BB Cream. As per the SkinFood website, the Honey Black Tea moisturizes and brightens the skin and makes it look soft and supple. This is exactly what this BB Cream did for me. Its slightly dewy finish gave my face a nice, subtle, and healthy-looking glow. I especially like the scent, too. It smells just like the SkinFood Royal Honey Eye Cream, which I'm still using by the way. The formulation is lightweight and very easy to blend, though I find it a tad runny. Watery even, as compared to the Rose Lemon Tea's formulation. Also, when you swatch the BB creams side by side (both are in 01 Light Beige), the Honey Black Tea looks much lighter. So light that the shade doesn't seem to match my skin at all. Left: Rose Lemon Tea / Right: Honey Black Tea. But once it settles on the skin, the Honey Black Tea adjusts to your natural skintone. You won't even be able to tell that the shade match initially missed the mark. However, the coverage is light - much like the Rose Lemon's. It's great for days when I'm too lazy to do my makeup and all I need is an even skintone. But for days when my skin is blotchy or when my eyebags are horrendous, this BB Cream wouldn't be able to give the coverage that I need. Staying power is so-so. It stayed nicely on my face for at least six hours. But that's on a blustery day, with a primer on. I reckon it'd fade away in half the time during the summer months. So I guess I won't go for full size anytime soon. The full size, by the way, comes in 30g tubes for all BB Creams from the Good Afternoon line. They're priced at 8000 won in Korea (Php 300+ when converted), while in the Philippines, they're sold within the Php 400 - Php 450 price range. Not bad considering how ridiculously expensive SkinFood products are in this country. 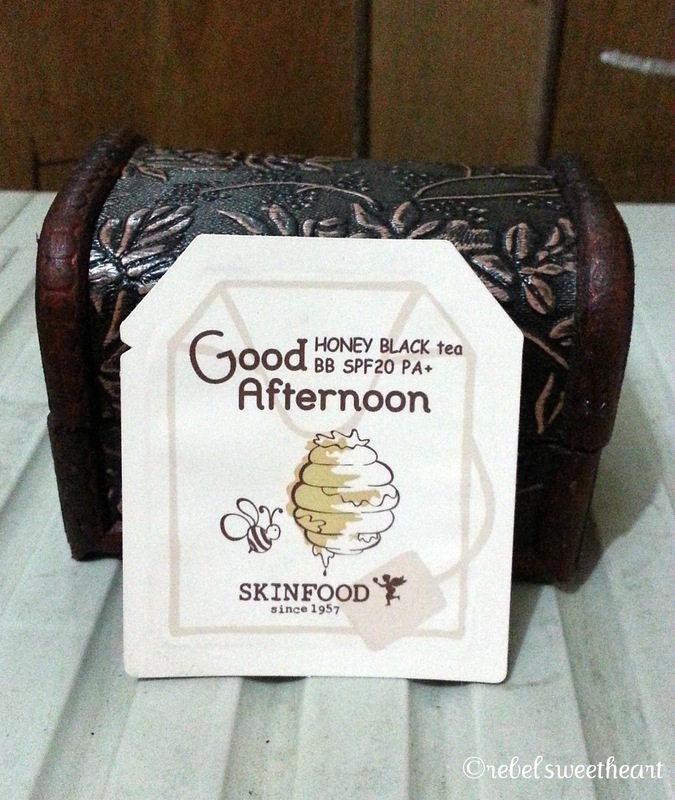 SkinFood Good Afternoon Honey Black Tea BB. Avon Ultra Luxury Brow Liner in Dark Brown, Missha Viewer 270 HD Curl Mascara in Black. 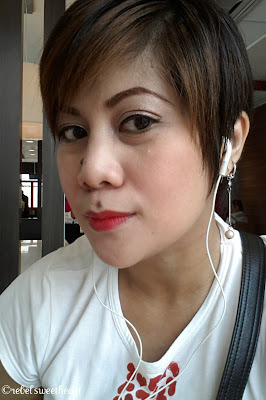 CHEEKS: Tony Moly Cheek Tint in Cherry Pink. LIPS: Etude House Shini Star (Taemin) Lip Balm, Miners Matte Factor Lip Paint in Warm Red. This should keep the skin healthy. I'm sure the post holidays eye bags will be gone soon. On your hand the before and after look the same, so it must blend very well. Watery and light sound good to me, hehe! 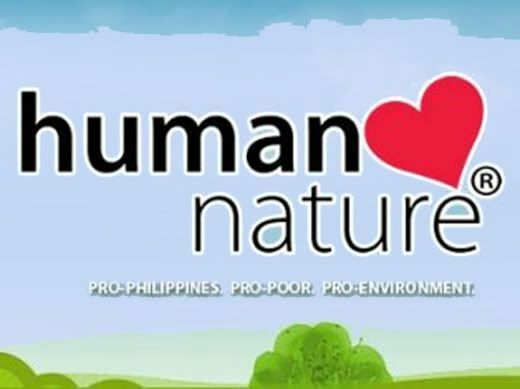 Buti ka pa you know so much about make-up! If only I knew how to apply everything I have properly no. First of all, I doubt seriously that you could ever have a bad complexion day! But I hear what you're saying about this not being enough coverage. I had a cream like that, and it just seemed to smear around, without really absorbing and had no staying power. But I guess you have to try all kinds to figure out what works for you. Great article! We should really take care of our skin but with the many cosmetics and health care available, its hard to keep track of which is which....There's just too many of them and it will be difficult to try it out. I bet the ladies don't have a problem with this situation.